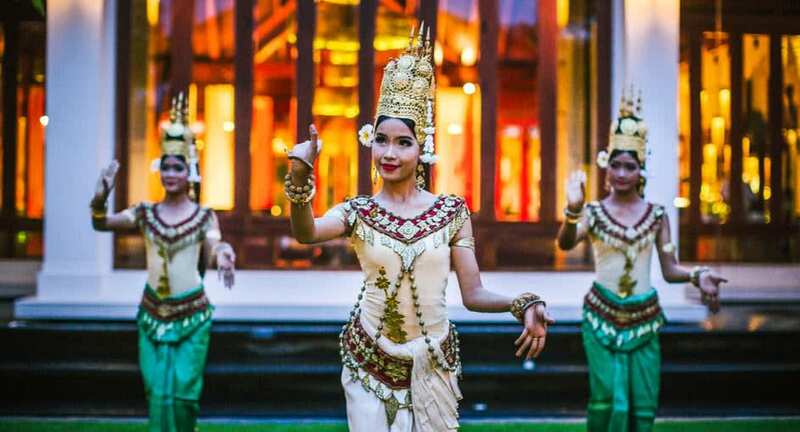 With design inspired by Angkor Wat and heavenly apsaras, Anantara Angkor is the ideal Siem Reap wedding hotel which provides a dream backdrop to intimate weddings. Host a traditional, multi-day Khmer ceremony, booking out the entire resort. Renew vows in a garden courtyard or poolside terrace, then dine on exquisite local cuisine and dance into the night. Frangipani trees and the soothing sounds of cascading water create a naturally romantic atmosphere. Ideal for up to 80 guests for thematic dining and 120 guests for cocktails. Surrounded by lush greenery, the pool area is intimate and beautifully lit up at night. Ideal for up to 60 guests for dining and 80 guests for cocktails. An elegant, contemporary space of teak wood and Khmer motifs. Ideal for up to 80 guests for dining and 120 guests for cocktails.